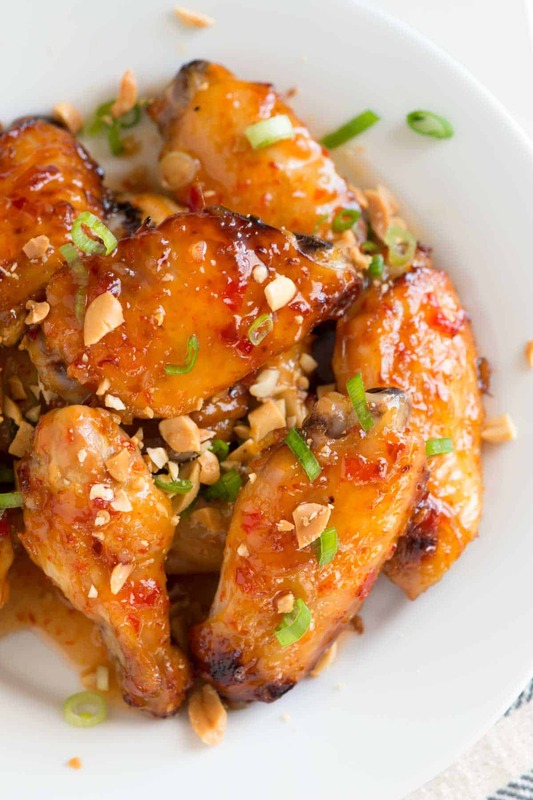 How to make baked chicken wings in an Thai sweet chili sauce. Jump to the Sweet Chili Baked Chicken Wings recipe or watch our quick recipe video showing you how to make them. It’s no secret that we love our chicken wings — especially baked chicken wings. Fried are good, too, but we’re not usually up to frying at home. 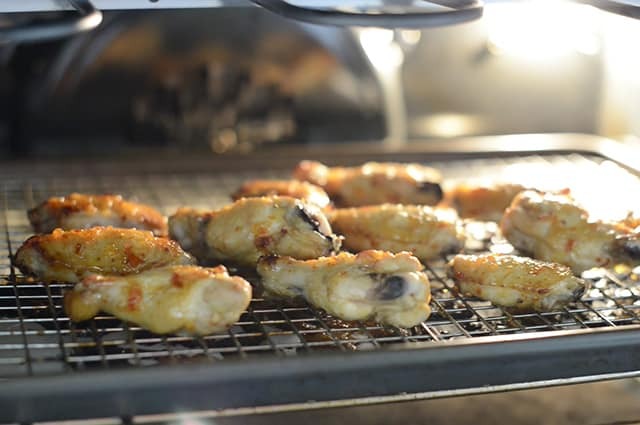 We’ve shared an original baked chicken hot wings recipe, brown sugar barbecue chicken wings and now, Joanne’s personal favorite – this sweet chili baked chicken wings recipe. They’re sticky, sweet, spicy and even have some crunch from chopped peanuts and sliced green onion sprinkled on top. 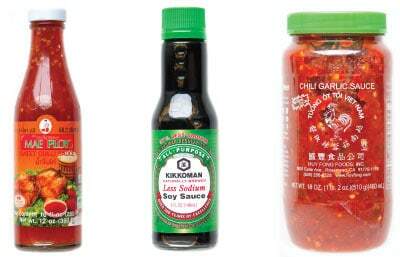 You’ll need Thai sweet chili sauce, light soy sauce and chili garlic sauce or fresh chili paste (sambal). All of the ingredients can usually be found in the International aisle of the grocery store, but if you don’t see them there, try an international market or online. It’s really simple. Add 3/4 of a cup of sweet chili sauce, 2 teaspoons of soy sauce and 1 or more teaspoons of the chili sauce, depending on how spicy you like things. We go for 2 teaspoons, but we like it spicy enough to make our lips smack a little. Toss the sauce with your chicken wings and bake until golden brown and crispy. By the way, if you need to know how to separate chicken wings, we’ve got you covered, just take a peek at our recipe video for how to cut chicken wings and you’ll be set. Or, watch the video up there and you’ll see how we do it. Once the chicken wings are baked, golden brown and sticky, stack them onto a plate and top with lots of sliced green onion and peanuts. We also use ground fresh chili paste or “Sambal” for this. You can find this in the same place as sweet chili sauce. It can be quite spicy, so taste as you add to make sure the sauce is not too spicy for you and whoever you may be serving the wings to. You will often find chicken wings that have not been separated into a wing and drumstick, so you may have to separate them yourself. For help with this, take a look at our step-by-step tutorial with video for how to cut a chicken wing. Heat oven to 425 degrees F. Line a baking sheet with aluminum foil. (If you have one that fits, lay a cooling rack inside the baking sheet, this helps get the chicken extra crispy – see note below). 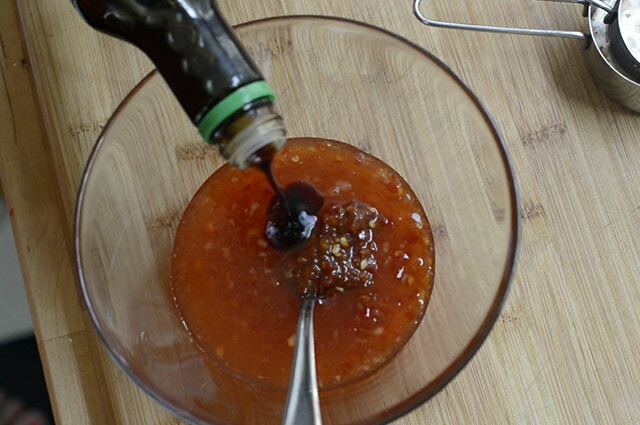 In a medium bowl, whisk together the sweet chili sauce, light soy sauce and one teaspoon of fresh chili paste. Taste and adjust the spiciness to your liking. Set aside a 1/2 cup of the sauce for tossing the raw chicken in and save the rest for once the chicken has cooked. Toss the wings with reserved 1/2 cup of sauce then add to the prepared baking sheet. Bake chicken, turning once during cooking, until opaque throughout and crispy, about 30 minutes. If you would like, spread or brush a little more sauce onto chicken wings half way through cooking. 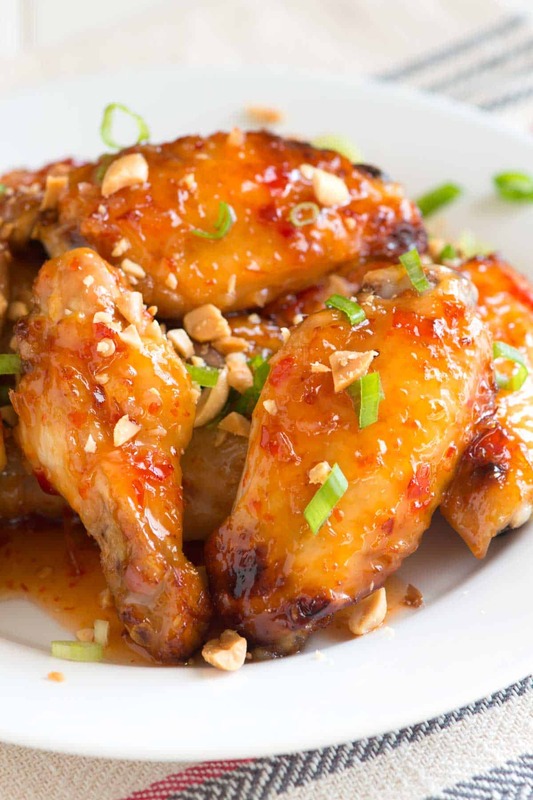 Toss cooked wings with the remaining sauce, pile onto a plate then sprinkle with sliced green onions and chopped peanuts. To cut chicken wings so that the drumstick and wing are separated, see our video and step-by-step tutorial. If you have a cooling rack that can fit inside your baking sheet, use it. The cooling rack will lift the chicken up, allowing hot air to travel around the chicken. 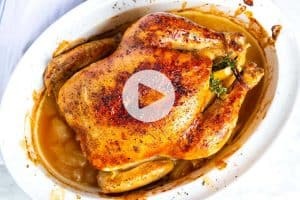 If you do not own a cooling rack that will fit inside your baking sheets, just place the chicken directly onto the foil lined baking sheet and make sure you flip the chicken at the half way point during cooking. probably because wings in the US are popular party food, especially in football season — when originally and in other parts of the world they are less popular, thrown away or considered “trash” parts of chicken. 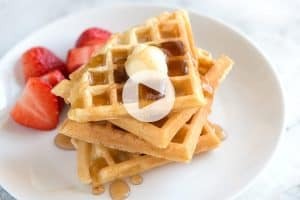 I am drooling thinking about it…great video, btw. 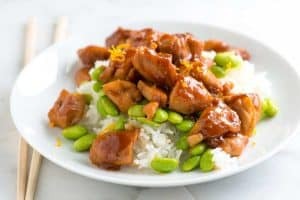 Here’s my feedback (a year late): if you follow the recipe above exactly, and use chicken thighs instead, you will get some fine tasting thighs! They went over quite well at last year’s Super Bowl, and were great as leftovers for the next few days. I tried them as wings following the directions above, and they were alright, but not as flavorful as the thighs. Going to try the wings again this year, but I’m to lightly bread and fry them first, the pour thr sauce over them (heated) then toss and serve. We’ll see what happens. Did you broil the chicken wings after you did the second sauce application and cooking? They look a lot crisper in the next shot when you’re adding the green onion. I just wonder why you don’t say. They almost look like they’ve been fried in deep oil in that last shot, which is not the way they were when you called them finished. 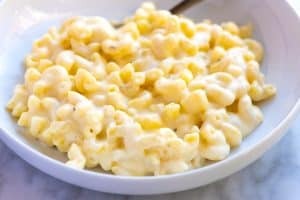 Not at all — All photos on this site are of the actual recipe. Hi Al, Broiling should work. Our only concern is that the wings with the sauce will char before cooking all the way through. We recommend baking first (about 15 – 20 minutes). Then broil about 5 inches from heat, turning once, until cooked through, another 8 to 10 minutes. Keep an eye on the wings under the broiler so they don’t char. Enjoy!